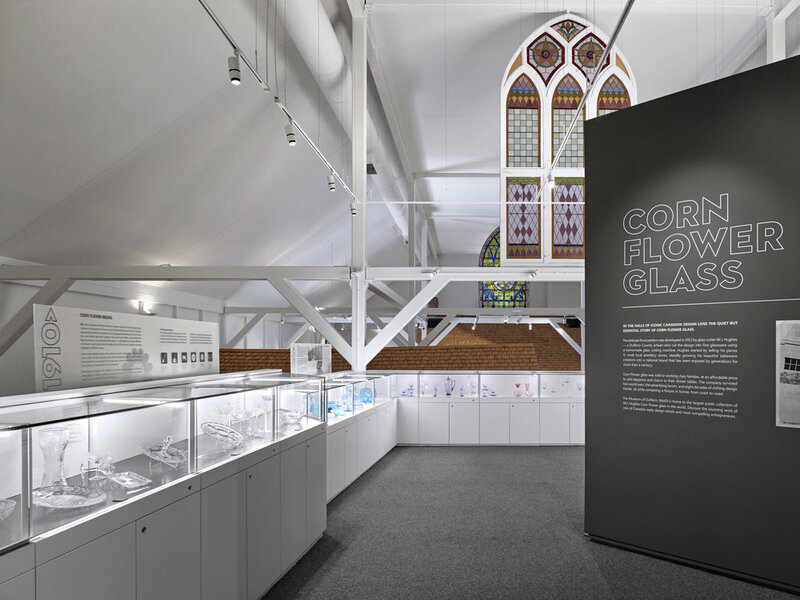 The design of the new Cornflower Glass Gallery at the Museum of Dufferin takes cues from various references and inspirations. The desire for the exhibition was to create something modern and dynamic while subtly referencing the history and technique of Cornflower and being true to Lebel & Bouliane’s design ethos. 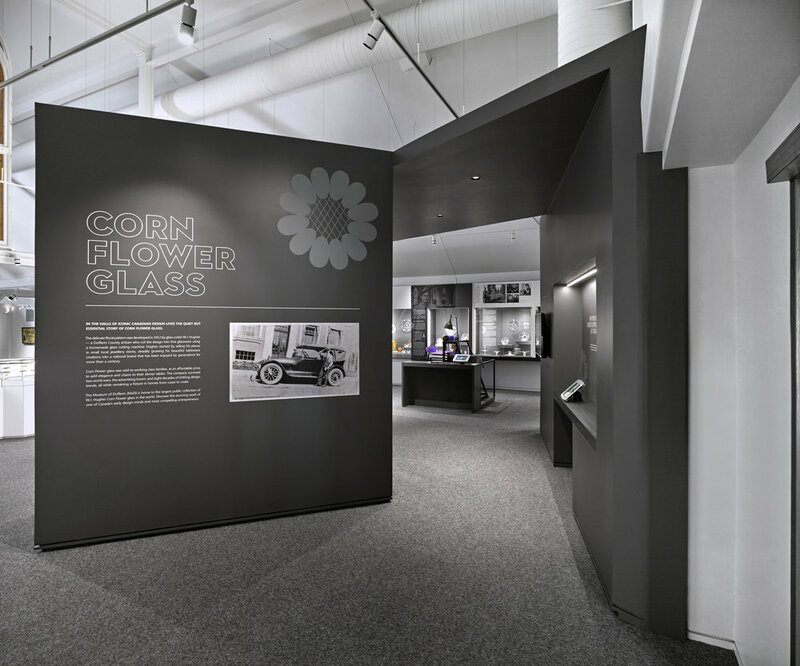 The contrasting color palate of white and grey pays homage to the original Cornflower Glass store, which featured clear glass displayed on a black background set back into white walls. Angled and faceted forms, a signature of Lebel & Bouliane’s, allude to the glass cutting and etching process while guiding visitors around the gallery and creating a sense of drama and scale. The existing metal guard rail on the mezzanine was removed and replaced with a glass railing to create a visual connection between the two levels of exhibition space. 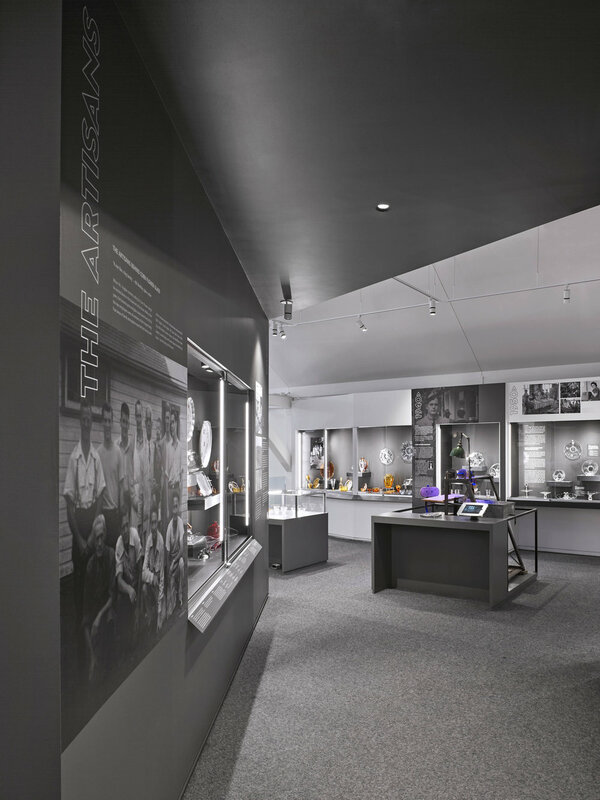 Lebel and Bouliane worked closely with Alula Lighting Design to test and implement a museum-quality lighting strategy that enhances the colour and texture of the cornflower glass without creating too much shadow or reflectivity. The Museum of Dufferin’s collection features many rare and unique colours of Cornflower glass, which warranted a special lighting strategy, the designers opted to use LED light pads underneath these pieces, lighting the glass evenly from below to create a sumptuous and jewel-like appearance. Playful details such as a Black Light case with a “push me” button and a peek-a-boo storage case that alludes to the shear volume of the museum’s collection add a light-hearted touch.